Welcome to Razorbacks Women’s Field! Women’s field is a fast-paced, strategic game that emphasizes stick skills and speed. This is a quick introduction for those who are just getting started in the game. Women’s field lacrosse is played on a regulation soccer field. In the middle of the field is a center circle that is used for draws after each goal is scored. 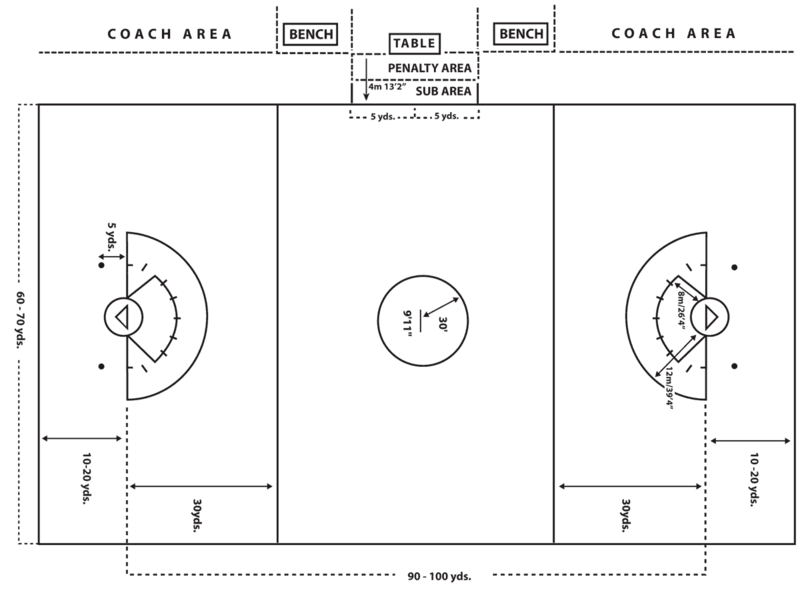 Halfway between the center circle and the goals on each side are restraining lines, which stretch from sideline to sideline. There are 12 players - three attack, five midfielders, three defenders and one goalie. A game consists of 2, 25 minute halves with a 5 minute break in between. Games are started with a draw. During a draw two opposing players line up in the center circle, and the ball is placed between their two sticks, about waist high. When the whistle sounds, the players must then lift the ball over their heads. As the ball comes loose, a free-for-all ensues with each team frantically scooping at the ball to try to gain possession of it. Draws are also used to restart the game after each goal is scored. The object of the game is to score more goals than your opponent. When a team is on offense, it can only have seven players in the attacking third of the field beyond the restraining line. The defending team also is only allowed seven field players plus the goalie behind the restraining line. This explains why you'll see players hanging back in the middle of the field, not getting involved with the play. It's not that they're cherry picking or too lazy to join the play; they're required not to cross the restraining line. If the ball goes out of bounds on a shot, the team with the player closest to the ball when it went out of bounds gets possession. You'll often see a team on offense keep a player or two behind the goal, in large part because of this rule. If the ball goes out of bounds on any play besides a shot, then the team that touched the ball last loses possession. No players are allowed to enter the goal circle, except for the goalkeeper. Within the 8-meter arc, a defender can only stay for three seconds at a time, or, as in basketball, the team will get called for a 3-second violation. On defense, unlike box lacrosse, absolutely no body checking is allowed. Instead, players can use their stick to check their opponents' stick to jar the ball loose. However, you cannot recklessly check your opponent's stick (that's slashing) or direct a check towards a player's head or violate the "sphere" which is an imaginary bubble about a foot in diameter around the head. Those violations will be called as fouls. The fouls in women’s field lacrosse are different than the penalties or rule violations that are called in box lacrosse. Many of the common fouls in women’s field lacrosse relate to rules that are designed to keep the players (who were very little equipment) safe. Women’s field lacrosse is non-contact game and, as a result, requires a lot less gear. Female players are pretty much set with a stick, head and some goggles. Some female players choose to wear gloves (but they are not required). The rules of the women’s game require shafts to be between 35.5 and 43.25 inches in length. Unlike a box lacrosse stick, a women’s field stick (or crosse) has no pocket. In fact, the rules of women’s field require the ball to be above the side wall when it is placed in the head. Goggles protect the eyes and temple from being hit with another player’s stick or the ball. Goggles should fit snugly against the head but not be overly tight. The bands will adjust to keep the frame firmly in place. They should sit over the tops of the cheeks. There are minor fouls and major fouls. When a foul is called, the referee blows the whistle, and all players must freeze right where they are. For a minor foul, the offending player must stand four meters back from where she was when the foul was committed. For a major foul, the offending player is placed four meters directly behind the player that was fouled. This is called a free position and, in effect, could lead to a fast break. If a team commits a major foul within the 8-meter arc, the other team gets a free shot at the goal from the top of the 8-meter arc. This is similar to a soccer penalty shot, and all defenders are cleared out of the arc. For a minor foul within the 12-meter fan, the player gets an "indirect free position" from the nearest spot on the fan, in which the player can run or pass, but cannot directly shoot at the goal.